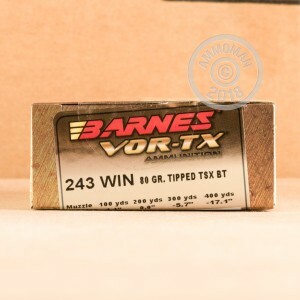 Take confident shots at deer and other game with your .243 Winchester rifle and this Barnes VOR-TX ammunition. 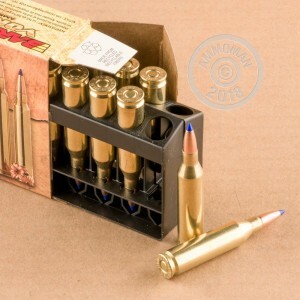 These cartridges come in boxes of 20 and fire a light 80 grain TSX bullet at a muzzle velocity of 3,350 feet per second. 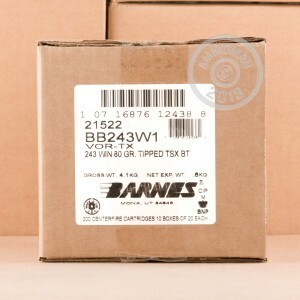 This high velocity results in flat trajectories, good accuracy, and excellent terminal ballistics. The TSX bullet is a polymer-tipped solid copper projectile designed to expand into four petals and bring down game quickly and efficiently. Its design incorporates grooves that help relieve chamber pressures by absorbing some of the expanding bullet material.